"One by one, Avacyn and her host of angels captured the most wicked demons of Innistrad, imprisoning them in the Helvault. Avacyn used this power very rarely, but as the demonic threat grew, she contained more and more of them until only the elder demons remained." Liliana Vess had finally discovered the location of the demon Griselbrand. The answer lay within Thraben Cathedral, gone to the grave with the recently entombed Lunarch, Mikaeus. But that only put a smile on Liliana's face. Getting Mikaeus to talk would be a welcome bit of fun after all the trouble she had endured evading fellow Planeswalker Garruk Wildspeaker and scouring Innistrad for her next demon. It was no easy task to infiltrate the catacombs of the great cathedral, let alone to necromantically pry information from the rotting lips of the dead Lunarch, but Liliana was never one to be scared off by a little dirty work. The corpse of Mikaeus told Liliana the tale of how, in an epic battle, Griselbrand and Avacyn both became imprisoned in the huge mass of silver known as the Helvault, plunging Innistrad into the darkness it had since endured. As Mikaeus told his tale, Liliana began to see that to get at Griselbrand, the Helvault would have to be destroyed. To get past the angels and cathars defending the Helvault, she would have to amplify her own dark magic with the Chain Veil once again. With a sheer cliff at her back and a small army of summoned ghouls guarding her, Liliana began her work at the Helvault. Thalia, guardian of the cathedral, rushed out with her cadre of elite cathars to crush the unhallowed horde, but Liliana was ready. Paralyzing the cathars with a wave of dark magic, she gave Thalia an ultimatum: either the Helvault or Thalia and her comrades would be destroyed. Thalia must choose. It took only the strangled cry from of one of her cathars as he fell prey to the ghouls before Thalia pointed to the Helvault and cursed the death mage. All sound ceased for a moment. Then a blast obliterated the ghouls and knocked the cathars to the ground. Liliana was thrown to the cliff's edge. None present took notice of the ribbons of dark Æther streaking into the distance—all eyes were fixed upon a golden helix as it streaked skyward from the Helvault. 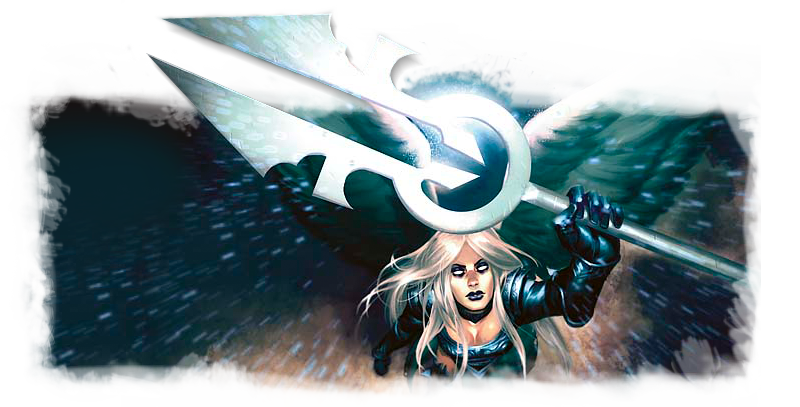 In a blinding flash, there was Avacyn. Within hours, a surge was felt by all on Innistrad as Avacyn's presence revitalized wards and blessings across the four provinces and beyond. The flights of angels returned, their despair dispelled by her presence. The divine archmages' power was restored. Gryffs returned to the skies and the renewed cathar army began to drive back the vampire and zombie hordes, banishing them from the human villages back into the gloom of Innistrad. Avacyn offered repentant humans afflicted by the lycanthropic curse a special place at her side. If they promised to serve as guardians of humanity, she would transform their curse, fusing the two warring aspects into a single noble creature. Many accepted her offer, and she transformed them into the wolfir.